Sir John Everett Millais, 1st Bt (1829-1896), Painter and President of the Royal Academy. Sitter in 75 portraits, Artist associated with 41 portraits. Rupert Potter (1832-1914), Barrister and photographer; father of Beatrix Potter. Artist associated with 29 portraits, Sitter in 2 portraits. Millais's Kensington home at 2 Palace Gate was located near to the Potters' family home, and he often visited to request Rupert's photographic services. Likewise, Potter frequently visited Palace Gate and Beatrix occasionally accompanied her father. 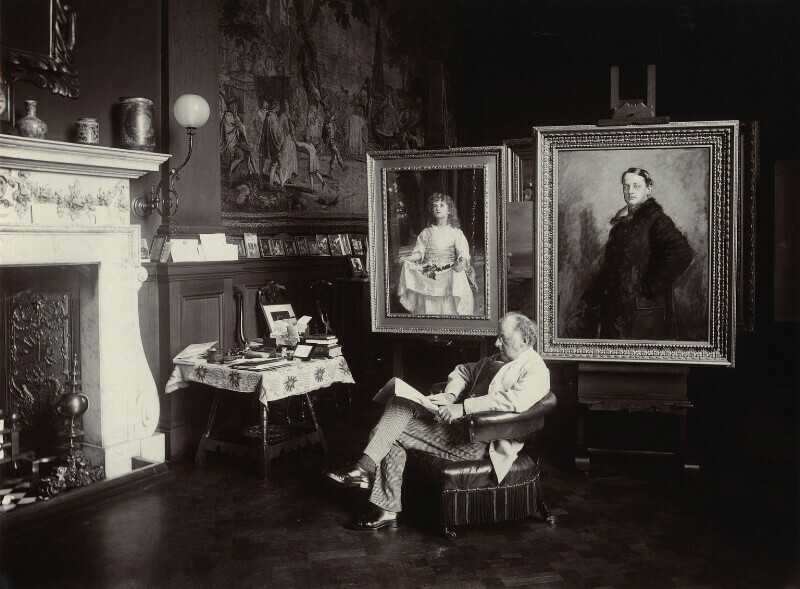 Millais is shown in his studio with his painting Lilacs (1886) and an unfinished portrait of the 5th Earl of Rosebery (1886) on easels.